You are still looking for the right spot to spend your final days of vacation for this summer? Well why not try villas for rent in Bali this time? Recently I came across a conversation between two friends of mine who planned to go to Bali thanks to a famous influencer which just came back from the gorgeous Indonesian island. Actually I always heard of Bali and knew it is a popular place for luxury travellers to spend their vacation there. Anyways I never considered it a place for myself. Not because I went on a 8-weeks trip through the Caribbean this summer, also because I would always get stuck in Italy or somewhere beautiful in Europe during my holiday planning. Interestingly, a friend of my colleague Lukas owns one of the most magnificent resorts on the island and my favourite hotel brand manages their second property on Bali too. Reasons enough I would say. I know Emirates has direct flights from Dubai and honestly I can't imagine a more comfortable way to reach Paradise from Europe. With just a little less than 17 hours from Central Europe, you reach the main airport of Bali (Denpasar) which is actually less than going to Australia or Hawaii. Of course it's always a great opportunity to go on a city trip before ending your Asia trip with a beach holiday on a sunny island. Since I am not a big fan of Hainan due to the massive amount of people flying there, I always preferred the Maldives along with Bali and Langkawi for the relaxing part of my business travels to Asia. What's better than going to an exotic Asian holiday destination after a week in bustling Hong Kong, terrifying Beijing or crowded Bangkok? Being one of the finest luxury travel blogs out there, it is our obligation to highlight the most luxurious places to stay on the island. While Bali has no shortage in luxury resorts, my Indonesian friend always tells me: "Never go to Bali by yourself!" I guess what he said is that Bali is the perfect place to go in groups. So set up a meeting with your squad, schedule a week once a year, book your flights and get yourself a place to stay. While I am totally in love with staying at a luxury hotel when travelling to cities, I have to admit that it's super easy and much (much) more fun to rent a villa for you and your friends. What's more fun than hanging out until the late hours while laughing and singing at your own volume without neighbours who are feeling disturbed? The best solution is trying villas for rent in Bali by leading villa rental company Luxury Retreats who also rents villas in Saint Barth, South of France, Italy and many more spots in the world. I actually tried it once during Easter. Five friends and me booked a villa in the Southernmost region of Italy, called Puglia. Our villa was situated within a luxury hotel so we basically had access to all facilities including main swimming pool in addition to our private one, spa & gym access along with the possibility to dine on site without needing a car or anything else. Best cocktails and most international Michelin-starred food at your fingertips? No problem once you go for the right villas. Considering to rent a luxury villa in Bali, Luxury Retreats has the best choice when it comes to style, location and facilities. The absolute high end option is renting one of the uber-luxurious 3-, 4-, 5- and 6-bedroom villas at the Amanusa resort. 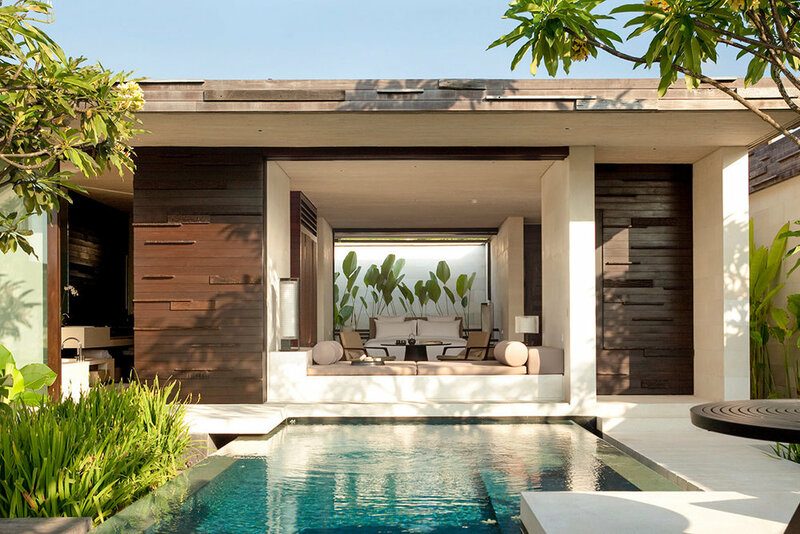 Being part of the renowned Aman group, Amanusa has often been referred to being the number one resort on Bali along being rewarded with various awards to be one of the world's leading resorts. While you are not just staying at one of the best properties in the world, you actually also benefit from all the amenities such as butler service, spa access, fine dining, beach club, library, tennis courts and round-trip airport transfers. One of the biggest advantages of staying at a luxury property is having a Concierge who can arrange everything you want ranging from a private dinner on the beach just for you and your friends, organising a yacht charter up to arranging a privat jet to bring you to Jakarta for a day of shopping. Boundless luxury at one of the most wonderful resorts in the world while still enjoying the privacy of your spacious and secluded villa. Another - slightly fresher - option is to rent a private villa at the Uluwatu Estate on the southernmost corner of Bali. Managed by stylish Alila Hotels & Resorts, these villas also come with full service including daily maid service, concierge, worldclass spa, different dining options along with access to the beach club situated 100 metres below the property. The astonishing situation on a cliff makes the Uluwatu estate one of the world's most photogenic properties. Cool, sleek design awaits you at nearly every corner of the resort, no matter if inside the flawless villas with floor-to-ceiling glass windows, wooden doors or outside at the perfectly appointed infinity-edge pool with its super chic sun beds between the villa and the ocean that seems to be one with the horizon. Now your friends laughing next to you opening a vintage bottle of Dom Perignon, just being treated by your butler with fresh fruits before you dip into the very private infinity pool to shoot the perfect Instagram shot. Let's be honest - this is the holiday everyone is dreaming of. And we are coming to my absolute favourite part of this article when I am telling you: Stop dreaming and start acting - life is too short to just dream of things you could do. At the end you will only regret the things you haven't done! Now it's your turn to take your iPhone, open your squad's WhatsApp group and post following link: www.luxuryretreats.com/vacation-rentals/indonesia/bali - just wait for their reactions! This article was created in cooperation with our gorgeous partner Luxury Retreats who supported us in publishing this travel inspiration. All above written is my personal opinion of spending a holiday and I wouldn't do vacationing any different.